Looking real good @applestar! Your off to a good start. I'm like you. I love this time of the year. I feel like I'm getting ready for "opening night". Lights, music, action....I'm like a kid anticipating Christmas! 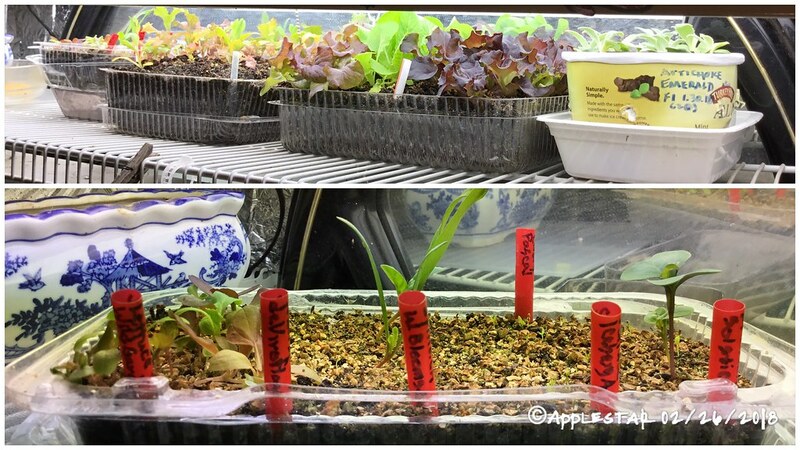 I started some seeds in the cold frames in my greenhouse last Saturday: lettuce, spinach, green onions (scallions), cabbage and Brussel sprouts. My jiffy pots arrived from GreenhouseMegastore. I bought 100 of them (4 x 4" square) for under $20. I used Cow Pots last year to start my outside vegetables, but I got an excellent deal on them; they are 5x more than jiffy pots wherever I looked this year. I am going to add: Wildroot Organic Mycorrhizal Fungi (15 species) Endo & Ecto Mycorrhizae Inoculant Powder Concentrate for Plants. This is found in many quality soilless seed starters. I just got a bunch of different flower seeds from Vermont Wildflower Farm including: lavender, butterfly weed, columbine, creeping thyme, marigolds, nasturtium, verbena, and zinnias. Vegetables will be: tomatoes, potatoes, corn, peppers, egg plant, cucumbers in addition to the ones I've already stated. I always have basil, parsley and oregano going inside. 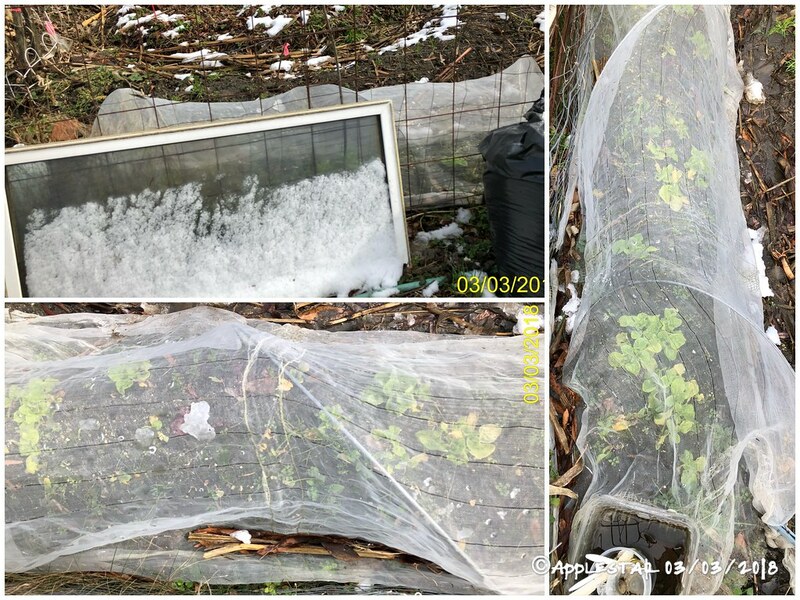 I'll start the seeds in my greenhouse on March 21. I am dying to start them now, but I don't want to start them too early. I can't move them outside until mid-May here in the Poconos. Thanks for the tip about the myco — I might try it. Please keep us posted. 1-oz must be a tiny little baggie but I suppose it doesn’t take much? - not many, but just a token amount to be able to say I grew some this year. - Red Chidori kale didn’t sprout well in the last round, so I’m trying again. ...seed fairy sent me some White and Broadleaf sages and VARIEGATED plantain seeds to try growing, and they started to sprout. Yay! @applestar...Yes, the scoop, that makes a gallon, is really small. The entire bag is the size of a large family size kool-aid envelope. The 1oz bag makes 50 gallons when diluted, and you really only need a bit on each plant. They say 1 gallon is enough for 100 - 1 gallon pots. What are you using for seed starter soil? It almost looks like a casserole in these last pics! What is that top dressing? @MoonShadows — 1st group of Red Chidori and a some others had damping off problems, so I decided to go back to basics and try just vermiculite. I do have to plant them in more nutrient mix quickly, but they are sprouting well. With other recently started batch, I’m pressing the seeds in top of the potting mix and then covering with vermiculite as top layer. ...do you want to see my seed starting log? - I’m not so concerned with overall germination rate, but like to note when first Sprouts put up above the mix. This helps me know what to expect -how long it takes them to start growing- from each kind of seed after sowing. - looks like IcebergA lettuce seeds are just too old, and the Solanacea broccoli seeds are only just. ...Time to buy fresh seeds! Looking good, I thought I had damping off on my Broccoli so I let it dry out, everything wilted then I bottom watered, we will see. Hows the Artichokes, I'm gonna try and get mine outside by next week and put them through vernilization for 10 days or so. applestar wrote: @MoonShadows — 1st group of Red Chidori and a some others had damping off problems, so I decided to go back to basics and try just vermiculite. I do have to plant them in more nutrient mix quickly, but they are sprouting well. With other recently started batch, I’m pressing the seeds in top of the potting mix and then covering with vermiculite as top layer. Do you use a fan, I have one set up to go on three times a day for half an hour to an hour, helps prevent damping off (sometimes), lets just say it gives a wider margin of error when watering. I keep one of my fans in my greenhouse running on low 24/7. I do use fans sometimes, depending on location. Most of the time, though I try to set up each location to create a passive thermodynamic air flow. I also tend to put them in the unheated garage as they grow, and the cooler temp forces stockier growth, especially for tomatoes IN THE 50’S, but it seems to work for the cooler season seedlings as well when the garage is in the 40’s. I wanted to make my own starting/potting mix as usual, but I had a hectic fall/winter and don’t have the key ingredient ready/available — screened Compost or well established and ready to harvest vermicompost. I really think that is the root of the problem. I’ve admitted defeat and ordered a couple of bags of premium organic potting mix to be delivered to a local hardware store. So hopefully I can rescue my sorry looking, slow growing seedlings and they will be ready when it’s time to plant them out. For the time being, I found last cup or so of tomato-tone which I can use to feed them with. 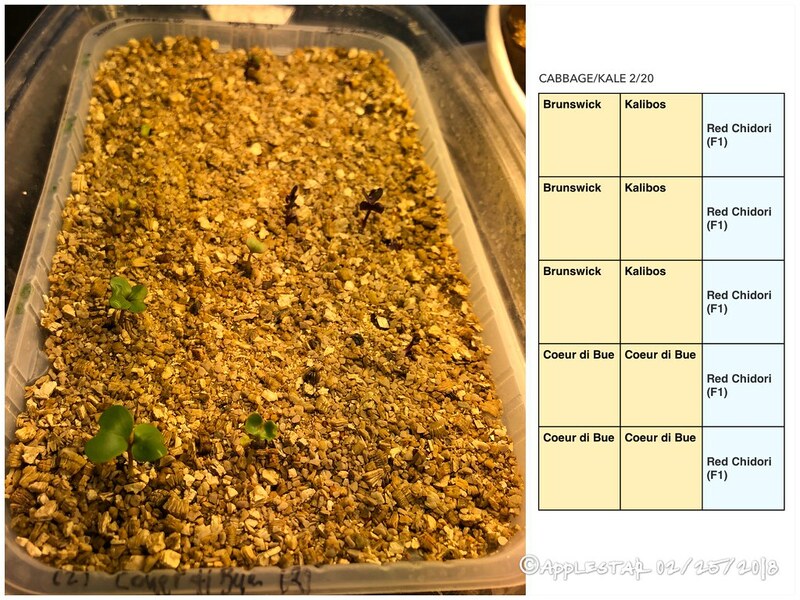 I have uppotted most of the cabbage and kale seedlings that sprouted in the vermiculite. Some of them are just sprouted and haven’t unfolded their seedleaves completely, but I’m shuffling the available spaces right now and resisting cleaning out/readying another shelf, so I stuck them in available spaces where the sage didn’t sprout.... if they survive, they survive, if not, I have enough. Two of the hot peppers — Barker’s Hot and Hanoi Market have sprouted at 7 days. 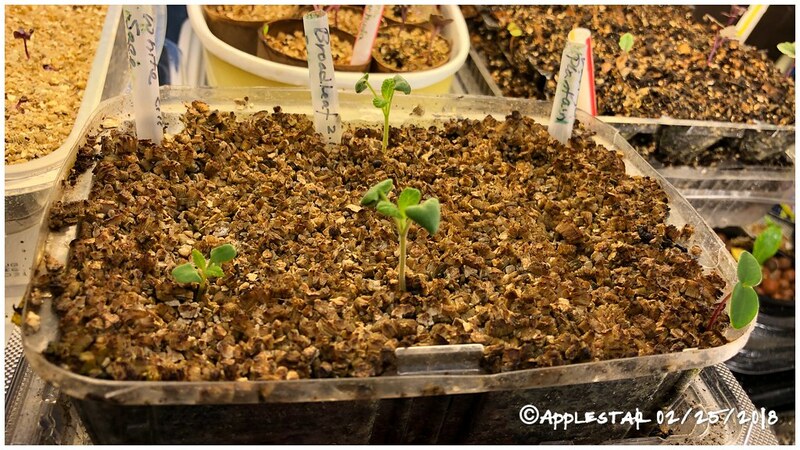 applestar wrote: I also tend to put them in the unheated garage as they grow, and the cooler temp forces stockier growth, especially for tomatoes IN THE 50’S, but it seems to work for the cooler season seedlings as well when the garage is in the 40’s. That is good to know, Ill cut my heat back to about 60 when my eggplant seedlings are started, thanks for the tip. I'm being inspired and that inspiration is needed because we all need that and it develops within but also from without. AppleStar, you have already reminded me that I should be starting my celeriac seed. I find that it's a little easier to grow than celery. Kale. Last year there were 4 types in my garden. They have all been there once or many times but not together. AppleStar has my favorite, the Portuguese. I've eaten Scotch since childhood and DW likes it a good deal. Russian is great but I've only grown it twice; fortunately, the aphids didn't bother it as much in 2017 as previously. I thought, "ah ha, chidori kale!" But, that's an ornamental. "Well, there's this variegated plantain ..." But, I've eaten the weed plantain and didn't think much of it ... I will wait for reports . 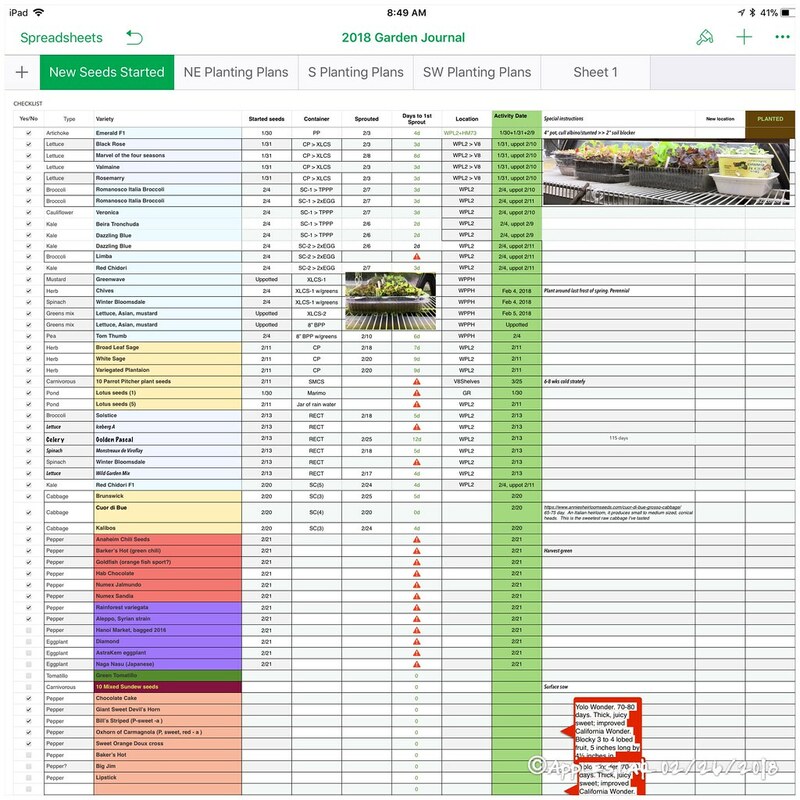 Looking at my seed lists, the tomato patch will be crowded as usual but not one thing new. I have my fingers crossed for the peppers, as usual. The list has not one thing new. I'm hopeful that the garden center will have something new in the seed potato bins but it will likely be entirely up to them and they are very consistent in having not one thing new! Squash, I will be trusting old favorites and bringing back a variety that did well twice before but, otherwise, not one thing new! In the ornamental beds there will be 4 new snapdragon varieties, quite a few new dahlias but in the veggies, not one thing new! Now before you say "artichokes" please know that I was born on the Monterey Peninsula and must have been frightened by fields of the plants as a small child . I don't know if artichokes would grow here but I'll allow others to grow them. What are your ideas for something that inspired you in recent seasons and you are inspired to start now, or soon? I’m going to try eating it, but maybe not so much the spring planting — we will see. I will definitely plant for fall crop later and try them in cooler weather/after a touch of frost as suggested. 50 days. Almost too pretty to eat, but we urge you to indulge! This frilly leaf kale has dark outer leaves and extra deep red central foliage. 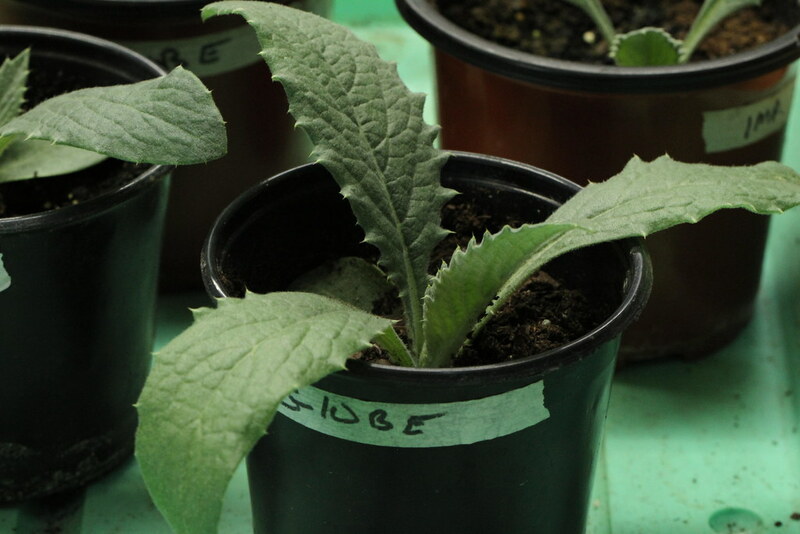 Plants stay compact for denser plantings. Cooler weather intensifies the brilliant color and also brings out its remarkable, sweet flavor. Whether planted in your vegetable or flower garden, you'll want to admire them, but one taste and you'll be craving more! According to this website, this variety has the best cold hardiness, which has always been a problem here since we seem to get down to freezing temps with very few warning frost days at or after first frost. I think I will try to make sure they are protected at least with open sided plastic sheeting roof they recommend at this site — I think it says enclosed tunnel is not recommended because you want them to get chilled for best color. Both the outer leaves and the colored parts are dark scarlet, coloring is also somewhat slow, but the degree of shrinkage tightness is outstandingly excellent. 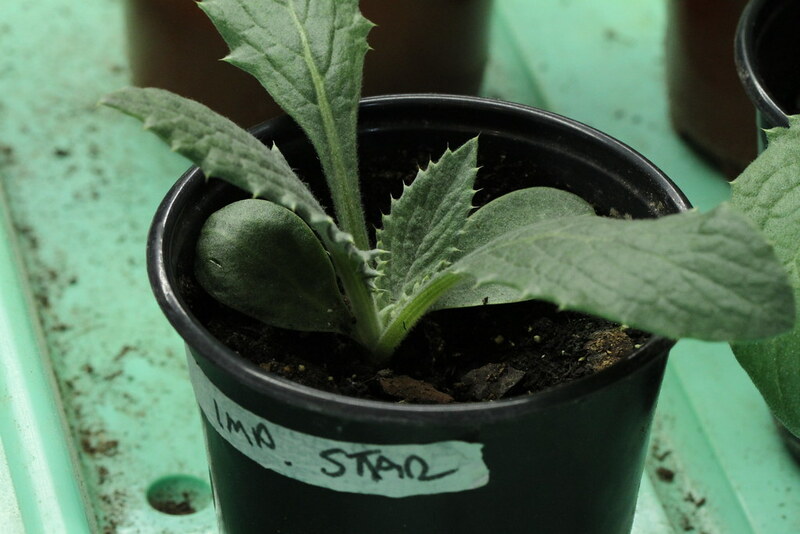 Dwarf species with particularly large number of leaves. Cold resistance is the strongest among the crepe type. Hopefully a whole bunch of new and old tomatoes, including Goat Bag which is reported to be better than Rebecca Sebastian’s Bull Bag.... as well as carrying forward my crosses and some of the superior performers from last year. Later for warm weather crop, a new winter squash will be Greek Sweet Red, and an SVB RESISTANT summer squash Tatume for sure. Trying a melon called Sweet Freckles. I decided this year to purchase eggplant and pepper plants instead of trying to grow them from seed in my greenhouse. It takes SO LONG to get them up and going for me. And I can use all the space for Cherokee Purple tomatoes, corn, beans and squash! 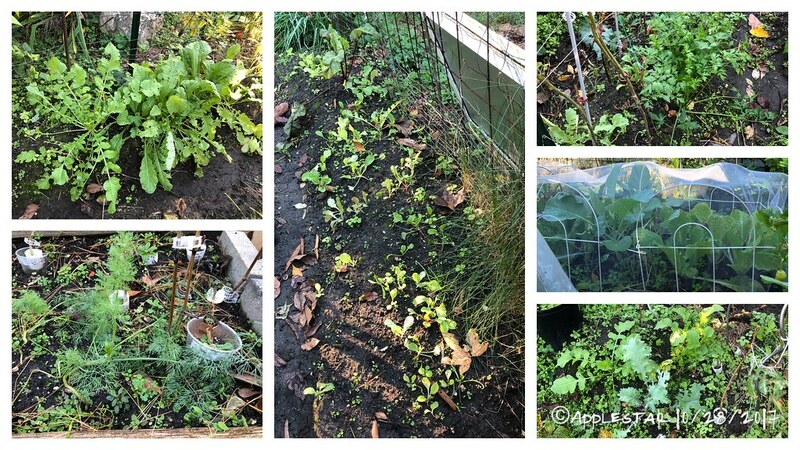 - I believe most of these under the long netting hoops are North Pole lettuce... I also see a few spinach. That window and the black bag of wood shaving were my desperate attempt to add some kind of additional protection. 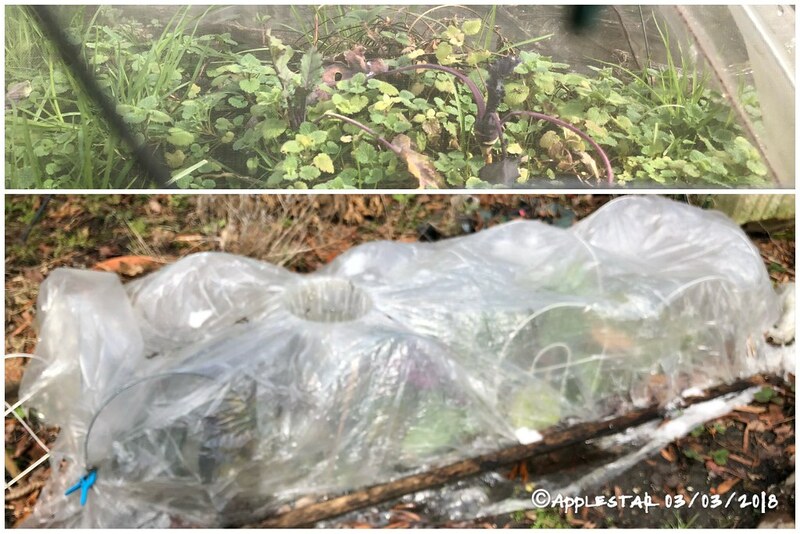 - What looks like purple Vienna kohlrabi in a weedy patch... and I was pressed for time and didn’t get a chance to peek under the double 3mil tunnel which was the bed that was supposed to have been harvested in the fall. I guess this would be my fall garden. I’m going to put hoop over everything to hopefully keep these greens going.